In four months, we (JT$ and Hammy from The Get Smart Team) went from fewer than 30 videos views to over 20,000 and growing. 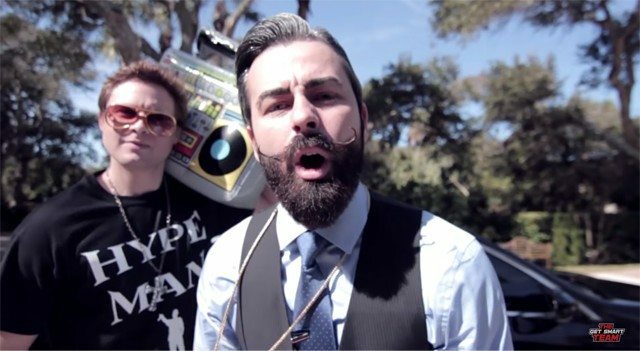 Our latest real estate rap “Get on the bond” has just over 5,100 views in under a month, and our first rap, “Prices going up,” is approaching 12,000 views. JT$ has been my moniker since high school, but I started writing rhymes long before that — and I loved doing it, but I wasn’t the best. I put writing and rapping behind me so that I could focus on my real estate career at the ripe age of 21. A decade later, my partner and I felt something was missing in our business, and we wanted to expand into something new. It is hard for someone to get to know you by just reading your profile. Being able to see someone on video is a completely different experience. Being able to see someone on video — their mannerisms and personality — is a completely different experience. We wanted to be a part of that while educating buyers and sellers on certain topics in a fun and interesting way. Our first video was professional, but looking back, it was extremely boring. We limited our creativity by trying to play it safe. When we didn’t get a lot of views, I did some research on other Realtor channels, and there was an obvious trend. Slides and videos of homes and even great real estate educational content weren’t being seen. Most videos had under 50 views. Why? They were standard fare among Realtor videos, and unless viewers were looking for that specific content, they did not keep your interest. We knew we had to do something different. I told my business partner that we need to make a real estate rap video. Though her face expressed uncertainty, she could see how passionate and serious I was about making the video. From there, we took a leap of faith and merged my love for rap music with real estate to educate buyers and sellers on topics in which we felt the market needed more information. Our first real estate rap video, “Prices going up,” is about home values rising. Even though the market changed significantly since 2012, many consumers still thought it was a buyer’s market in our area. I thought I would get the word out that prices are going up and also explain why, when and how the market changed. I wrote the song in about an hour and ordered what was needed for the video. We shot the video in about four hours. The best part was including friends and past customers for parts of the video. I sent the song to a bunch of people at our local news station via email. To my surprise, the next day I received a response, and our video was on the news a few days later. Had this been your typical real estate video, it would have never aired. There were certainly people against the idea, but once it aired on the news it helped solidify that what we were doing was legit. Of course, with the success of “Prices going up,” we started working on our second rap. Both ideas came naturally from the feedback we were receiving and the market. Because many first-time homebuyers knew little to nothing about the Florida bond program, we decided this should be our next song. “Get on the bond” was a much more ambitious project, and we wanted it to be different than our first video. We decided to create a story that progressed from beginning to end. Of course, this made everything much more complicated, and I even had to create storyboards with stick figures to keep organized for filming. The video shoot took 16 hours over two days, and we shot it in four different locations — not including some scenes we had to reshoot. Overall, the response has been positive. Surprisingly, an age group (the over-50 crowd) that we did not think we would have a lot of success with has been extremely supportive. Even though everyone’s music taste is different, I think we were able to cross over with humor that any age group could appreciate. In trying to become a professional real estate agent and overcoming my youth and inexperience, I overlooked something important in our industry that separates us from other fields. We have freedom to use our talents within our business to market ourselves creatively. We have a lot of freedom to express who we are and use our talents within our business to market ourselves creatively. I finally embraced that, and now I’m more passionate about real estate than ever before.